Sometimes when you want to create a card you’re really proud of, all you need is a little inspiration. At Stampin’ Up! we call that CASE which stands for Copy and Share Everything. I also like Copy and Selectively Edit because it more accurately reflects what we are doing. Inspired by Global Design Project #GDP140; Case the Designer Challenge featuring Brian King. This week at Global Design Project, it’s time to CASE the Designer. This week we get to create a card inspired by Brian King—my Stampin’ Up! dotted line. Four years ago, Brian noticed that I purchased a bunch of stuff from Stampin’ Up! and suggested that I save a bundle by joining as a Demonstrator. I did and have had so much fun and made many new friends along the way including those on the Global Design Project Design Team. I’m so grateful to him for that. Learn about saving a bundle yourself by joining my team here. Speaking of bundles, this week is your last chance to get this one. It includes the Petal Palette stamp set and Petals & More Thinlits dies at a 10% discount when purchased together. There are so many stamps included in this beautiful set; it comes in two cases. 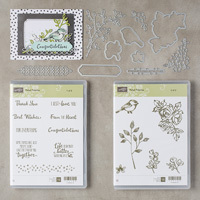 Everyday cards are a cinch with these lovely florals, background texture and adorable bird. 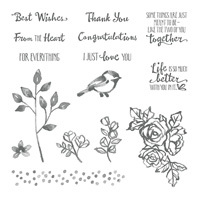 The set also includes eight sentiment stamps that cover lots of everyday situations. Starting June 1, 2018, the stamps and dies will still be available, but sold separately. I really enjoyed creating a palette of Petal Pink, Soft Sea Foam and Tranquil Tide reminded me of Brian’s card, but gave me a chance to use some fresh, new colors. 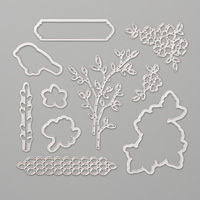 Try stamping on Designer Series Paper. I chose a piece from Tranquil Textures coming June 1 in the 2018–2019 Annual Catalog. I used Soft Sea Foam ink to mimic the textures in Brian’s card. A little watercoloring with Petal Pink ink over the bird stamped in Tranquil Tide adds just enough to carry the color I used for the background of the sentiment. Now we don’t usually recommend watercoloring on images stamped with Classic Stampin’ Pads, but breaking the rules can create magic sometimes. Since the stamp looks watercolored anyway, a little blurring of the edges didn’t hurt the feeling I was going after. Thanks for stopping by. I hope you enjoyed the card today. Please show Brian King some love and CASE his card with your own ideas at Global Design Project. Last Chance to purchase 2018 Occasions and 2017–2018 Occasions Catalog products. This is jaw-on-the-floor gorgeous, Shawn! Every detail is inspiring and wonderful! You have such a great style, and I love how you’ve walked us through the products. So happy to know you and thrilled I get to work with you. Subscribe to my mailing list and get notified about special promotions and when new projects post. First Time Shopping? Click here. Be sure to check out the Current Promotions here. This blog and all its content is the sole responsibility of Shawn de Oliveira, an Independent Stampin’ Up! Demonstrator and the use of and content of the classes, services and products offered on this website are not endorsed by Stampin’ Up!